The expected behaviour is to stop the target under debug and disconnect from it and leave it in the stopped state. Similar like the ‘stop button’ on audio or video devices. The expected behaviour is to leave the target as it is (running, suspended) and disconnect the debugger from the target. With the exception of disconnect while suspended, the P&E connection behaves as expected. The Segger GDB connection throws an error for disconnect, and the terminate action seems to exposes some race conditions. The LinkServer has the terminate button disabled. Below some tips how to configure the behaviour. The P&E connection offers both the ‘terminate’ and ‘disconnect’ buttons, so it is close to perfect. But there are no settings I’m aware of to configure the behaviour in the launch configuration. The LinkServer (LPC-Link2/LPC-Link/CMSIS-DAP) connection offers the terminate button and the disconnect button is grayed out/disabled. nochange: I’m not clear on this one, but it does a ‘stop’ followed by a ‘disconnect’? While this is a very flexible way to configure the ‘terminate’ action, it would be easier to use if the ‘disconnect’ button would be available. Otherwise I always have to go into the launch configuration and change the settings. For Segger J-Link debugging, there is the option to install the GNU ARM Eclipse plugins (see “MCUXpresso IDE: Importing Kinetis Design Studio Projects“). With the GNU ARM Eclipse plugins the disconnect button is disabled. The ‘terminate’ always does a ‘restart’. What it does for me is to reset the target but keep it halted. 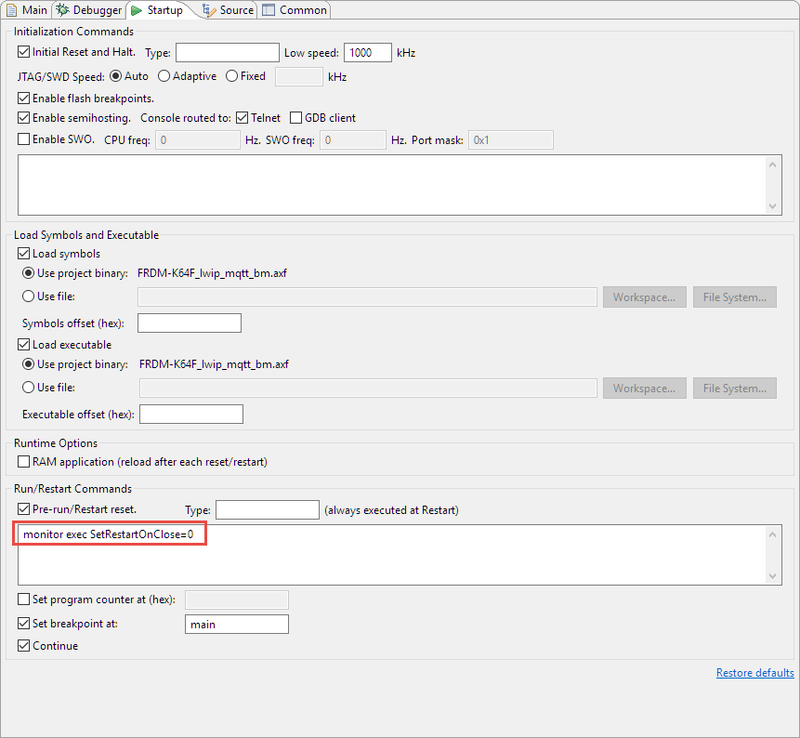 006,736 31^error,msg="Remote doesn't know how to detach"
006,746 32^error,msg="Remote doesn't know how to detach"
Terminate and Disconnect can mean different things for different Eclipse implementations. The P&E implementation is mostly following what I expect, and the NXP LinkServer implementation has configuration setting for the terminate action. If using the Segger J-Link in MCUXpresso IDE, with using the GNU ARM Eclipse plugin I have a command line option to control the J-Link behaviour. 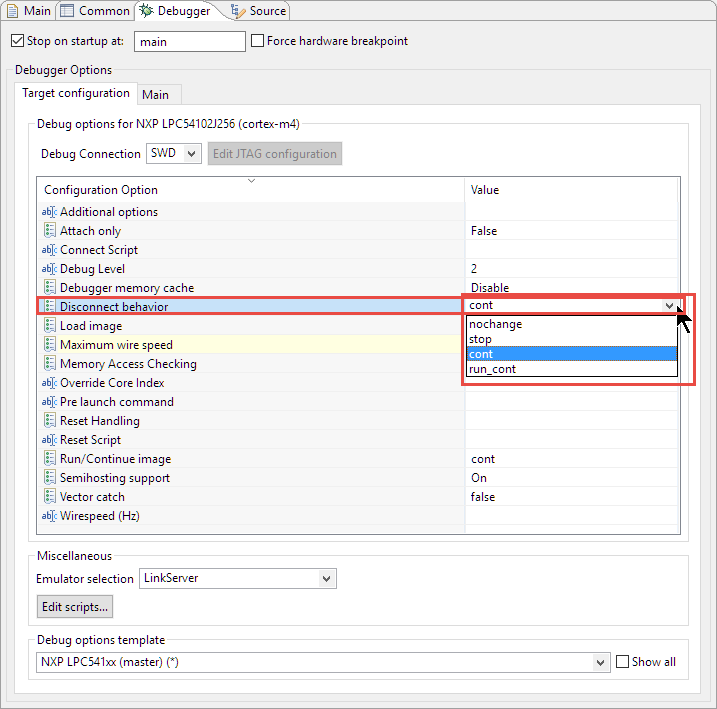 This entry was posted in ARM, CPU's, Debugging, Eclipse, Embedded, Freescale, Kinetis, LPC, LPC, MCUXpresso, MCUXpresso IDE, NXP, Tips & Tricks and tagged Debugging, Eclipse, Embedded Component, Freescale, J-Link, LinkServer, LPC-Link, LPC-Link2, Multilink, NXP, P&E, Segger, technology, Tips&Tricks by Erich Styger. Bookmark the permalink. Another way to stop debug can by terminate button which on console view. The terminate button which on toolbar has some problem for GNU ARM Eclipse, It will halt cpu when stop debug. But i want the cpu is running when debug session was stopped.